Egyptologist Gerald Massey challenged readers in A Book of the Beginnings to consider the argument that Egypt was the birthplace of civilization and that the widespread monotheistic vision of man and the metaphysical was, in fact, based on ancient Egyptian mythos. 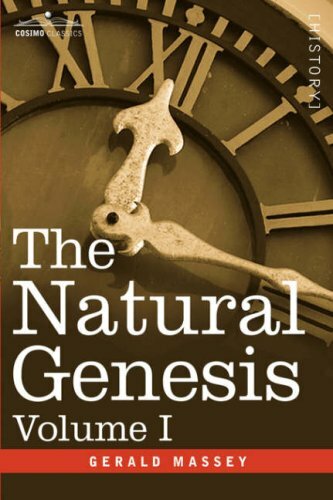 In The Natural Genesis, presented here as a two volume set, Massey delivers a sequel, delving deeper into his compelling polemic. In Volume I, he offers a more intellectual, fine-tuned analysis of the development of society out of Egypt. From the simplest signs (numbers, the cross) to the grandest archetypes (darkness, the mother figure), Massey carefully and confidently lays the cultural and psychosocial bricks of evolutionism. Volume II provides detailed discourse on the Egyptian origin of the delicate components of the monotheistic creed. With his agile prose, Massey leads an adventurous examination of the epistemology of astronomy, time, and Christology-and what it all means for human culture. British author GERALD MASSEY (1828-1907) published works of poetry, spiritualism, Shakespearean criticism, and theology, but his best known works are in the realm of Egyptology, including The Book of the Beginnings, The Natural Genesis, and Ancient Egypt: The Light of the World.